A large early Austrian bronze. which may have been used for trinkets, business cards, soap, as a pen holder etc. This is, indeed, an eye catcher of great quality and in very good condition considering the age. Interesting, you can see clearly that the ancestors of the bird were dinosaurs. 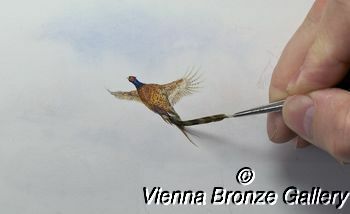 Remember that domestic shipping is free for all our Vienna Bronzes, regardless of size, weight and value. And it is also free for our friends outside the U.S. if we can combine three and more. This refers to all countries worldwide. No exceptions. The sculpture is very heavy with more than 10 pounds! The bird alone: ca. 2 5/8 (6.5 cm) tall and 9 “ (23 cm) long. The marble is 3/4 “ (2 cm) thick, 10 3/8 “ (26.5 cm) long and 8 1/2 “ (21.5 cm) wide. Good with minor paint loss. Original paint, no restoration, no repairs, no touch ups! The marble shows some fleabites.